Want a free watch? Yes! Orient Watch USA is giving away the above watch free to a lucky reader of this blog. 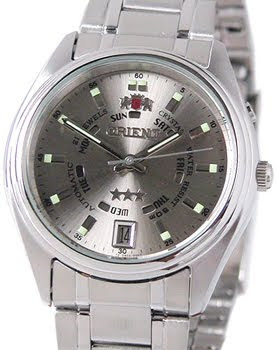 It is an Orient Automatic watch and its yours free if you win this give-away contest! Commonly known as the Orient 3 Star, this is a 21 jewel Orient movement, (I think its caliber EMZO), which has an interesting day indicator where a disk rotates and shows the current day of the week as a red dot on the dial. Quick set date button at 2 o clock, water resistant is 5 ATM. Stainless steel 37mm watch case with 20mm lugs, mineral glass crystal. I think this watch got a retro, 70s look and will make an interesting addition to any collection. The selected winner will receive the free watch from Orient Watch USA, shipping cost will be taken care of too! * Your email address must be included in the comment post for purpose of this giveaway. * Contest ends 2 weeks from now (8 April 2010 GMT time). Comment posts after said date will not be considered. * Winner will be contacted by a rep/assign of Orient Watch USA for the receiving of the prize. * This contest is only available to US residents only. Update!!! Contest had ended, pending results. Thank you for your participation. The watch itch had struck again. I had been staying away from buying watches but I find my passion reignited when I kept bumping into watch enthusiasts here and there. Recently I was at lunch with an associate of mine and he was wearing this timeless classic. I must admit that I am predominantly a sports and tool watch guy (watchuseek forum influenced) so I don't have many 'real' dress watches for those formal occasions. So this Movado really attracted my attention with its clean, sleek design. And come to think about it, Movado watches had stayed true to their design for the past 50 years with its 'Museum dial' even today it still look so modern and timeless. And one thing leads to another. While I was seriously tempted by this watch, I saw another great deal while surfing around; Invicta watches. The Invicta 6348, Grand Diver GMT. I was attracted by the blue and yellow colors, and the very nice looking mesh bracelet. The bezel is a bit 'omega-seamasterish' and on first look seems to be a SMP homage, but its not. I love the sword hands and how the blue and yellow contrasts on the dial. A great looking watch. I imagine it will look nice on a blue or yellow strap too. IMHO a great candidate for PMWF.com's Top 20 list. Looking at the specs, it seems to be a great deal at only about $82!